We don't know about you, but we love scrolling through photos of well-styled interiors. Our "dream home" Pinterest board — filled with images of beautiful spaces including one of our fave rooms in the house: bathrooms — can attest to this fact. Though our tastes vary widely (hey, we just love great design), there is one thing many of these aspirational bathrooms have in common: tile. A consistent theme across our most beloved spa sanctuaries, this element comes in all different shapes, sizes, colors, and materials. And while we're big fans of everything from ceramic and cement to marble and porcelain, as of late, we can't stop pinning glass tile bathroom ideas, and you're about to see why. 1. Go all the way. Sure, you could swath your entire space in glass subway tile, or — and hear us out — go the more cost-effective route without skimping on style. 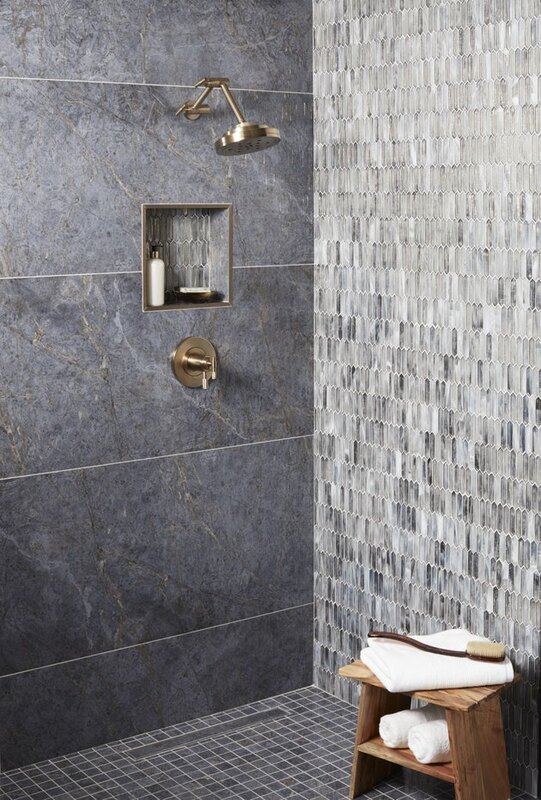 For that, we love the look of a linear accent, as evidenced by this shower. Beautiful details abound in this bathroom designed by Katie Campbell. 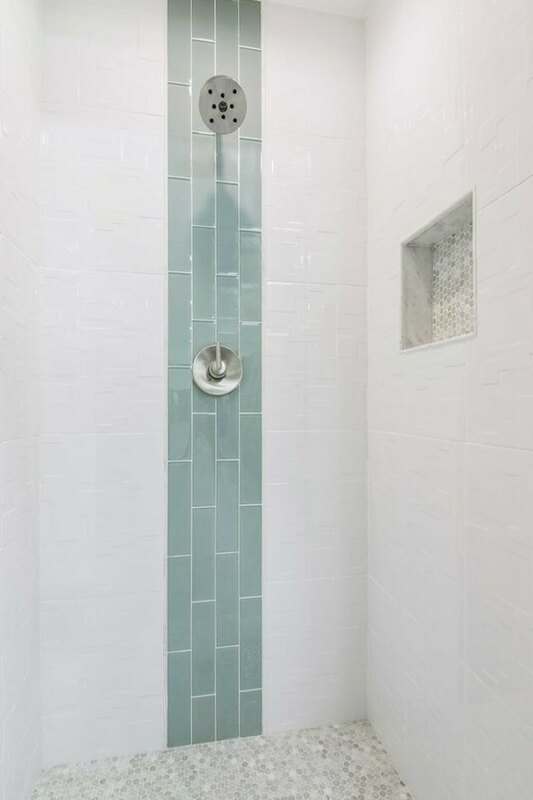 Notably, the use of pale mint subway tiles and white iridescent glass touches that transform these simple shower niches into a stunning focal point. 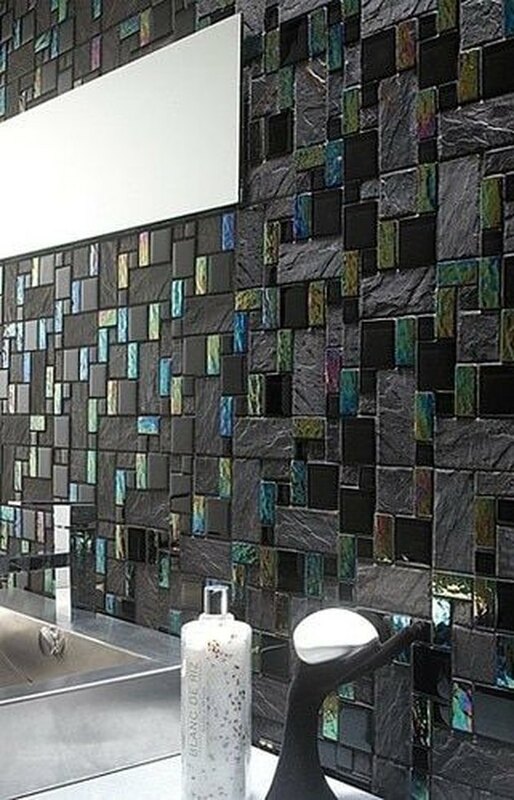 The combination of slate, iridescent, and glossy black glass tile in this bathroom is the epitome of drama. Add in some accessories, like a matching hand-shaped soap holder, for even more intrigue. 5. Create a cohesive concept. 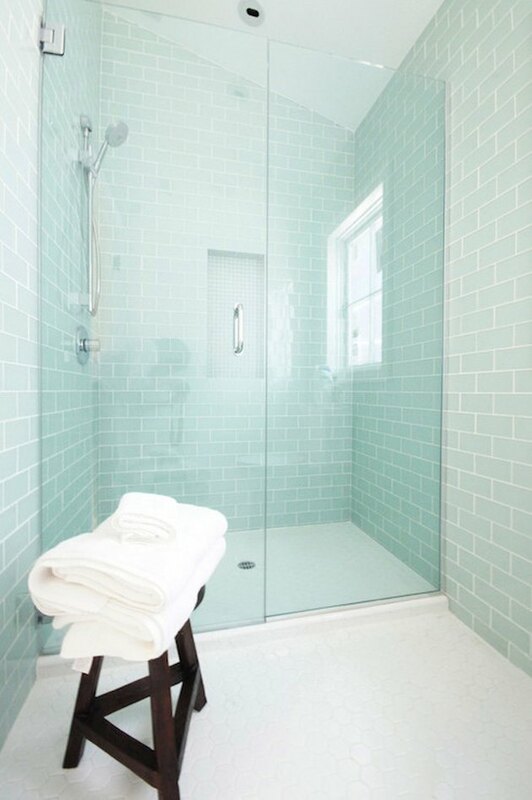 Here's another exquisite glass tile bathroom idea, courtesy of Rachel from Craving Some Creativity. 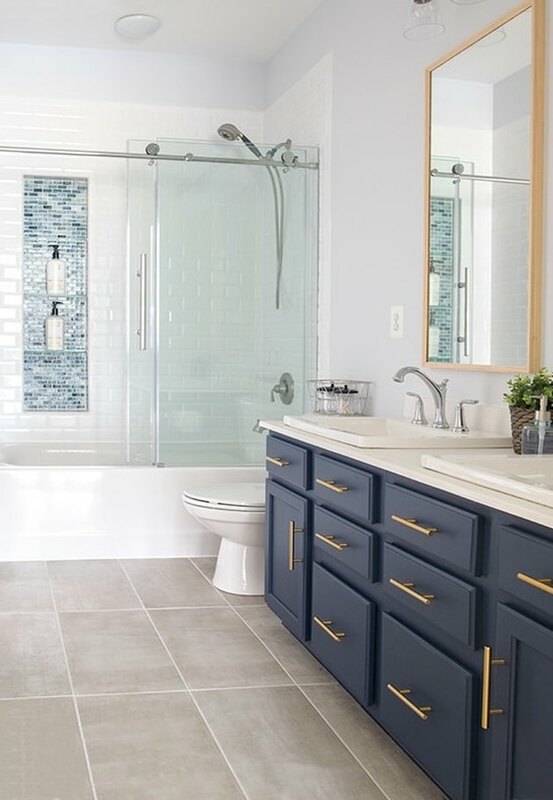 The glass shower niche in shades of blue seemingly comes to life when paired with navy blue cabinets against a white background. 6. Or, opt for all-white. There's something so striking about an all-white palette (when executed properly). 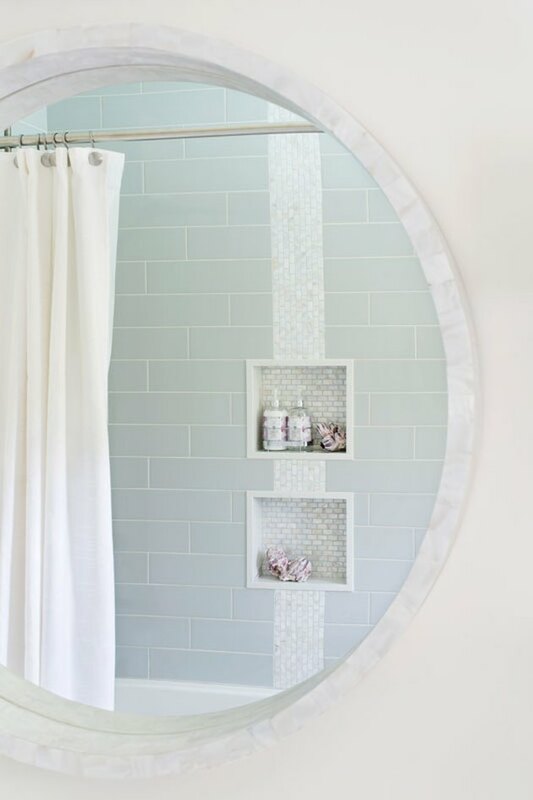 The trick is to bring in something that makes a statement — whether that's a jaw-dropping piece of furniture or, in the case of this glass tile bathroom idea, circular mosaic accent wall. 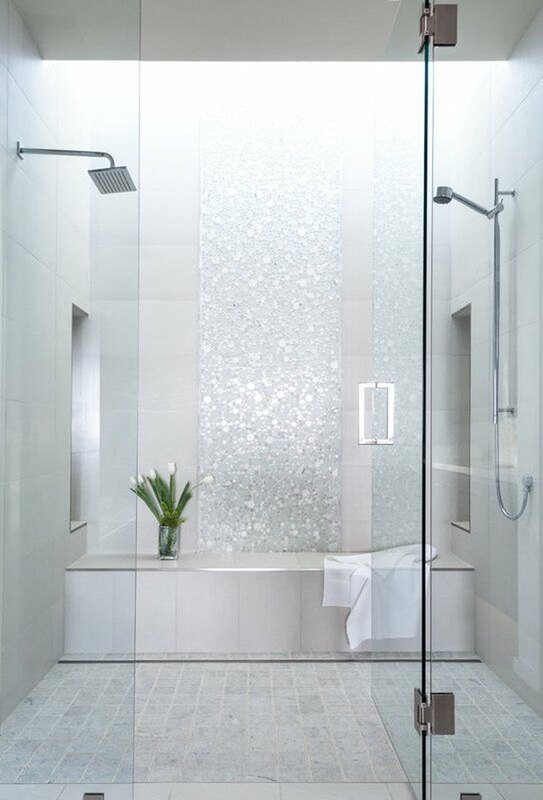 We're beyond obsessed with these silver diamond-shaped glass tiles. Covering the entire shower in this mesmerizing option would be overkill, so the large porcelain slabs strike the perfect balance.